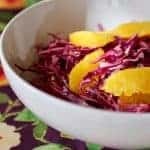 Orange Cabbage Cole Slaw is a super easy salad. Fresh orange sweetens the deal because cabbage can run on the bitter side. April brings green grass, song birds, and tax day. Paying those taxes can take a bite out of your monthly budget. But you can eat healthy on a budget. Here are seven ways to stretch your food dollar for cheaper healthy meals. It’s estimated that we toss about 20 percent of the food we buy. That means if we leave the store with five bags, we drop two in the parking lot. And leave them there. That is not a savings technique! But a grocery list is. When you purchase with a purpose you make better use of your groceries. With a grocery list in hand, you are less likely to buy impulse items and more likely to buy what you need which means you spend less. A sure way to overspend is by wandering through the aisles and tossing whatever looks good into your cart. 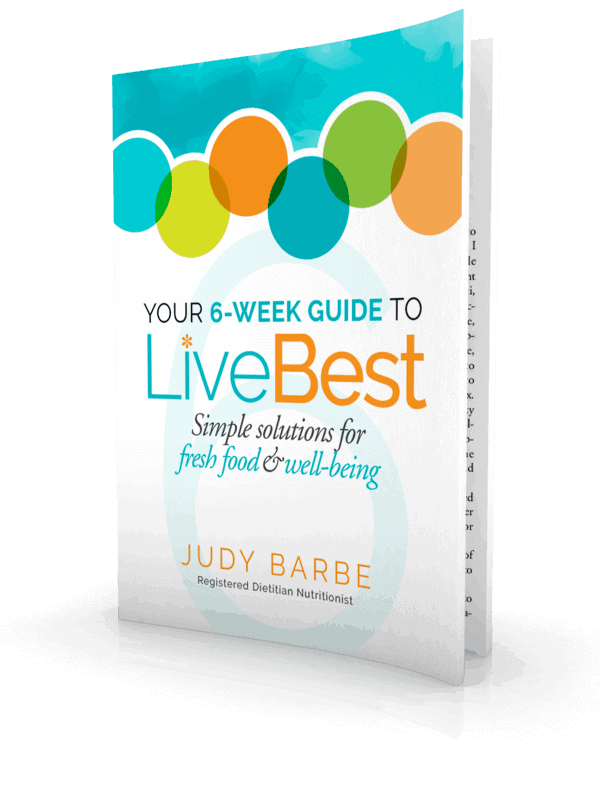 Here’s a LiveBest grocery list. Seasonal foods are a bargain hunter’s friend. Strawberries, asparagus, artichokes and rhubarb are Spring’s early produce. Grocery stores feature and discount these items now because they are in season. But still price shop. I found green beans less expensive than asparagus and potatoes on sale, so those went in my cart. As you plan and shop, keep your schedule in mind. If you’re too busy to cook much this week, you don’t want to stock up on fresh produce. A study from the University of Arizona found that Americans pay close attention to sale prices, but not the money squandered through wasted food. If you end up throwing it out, the BOGO, buy one, get one free, may lead to wasted money and food. 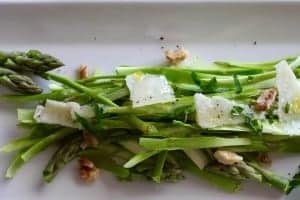 Here’s a quick recipe for a fresh Asparagus Walnut Salad. If you find you are throwing away withered fruits and vegetables, consider canned and frozen. Canned and frozen can be less expensive than fresh plus the convenience means they’ll be ready when you are. Most are picked and packed at the height of ripeness, so nutrition is peak too. Lower sugar and sodium canned foods is a good way to go. Frozen fruit without added sugar or syrup and plain vegetables usually cost less and help keep calories in check. 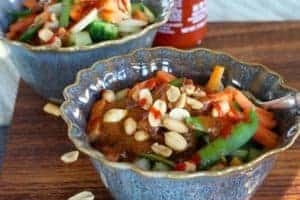 I used frozen vegetables in Peanut Asian Rice Bowl. Consider store brands. These private label brands are often 15 to 20 percent less expensive but just as nutritious as their national brand counterparts. Use the unit price to compare cost of varying sizes. Beans and legumes are money-saving foods. They are as good for you as they are versatile. 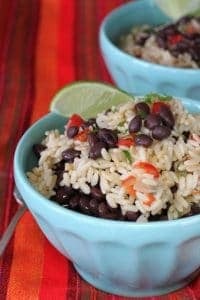 Brown rice, quinoa, bulgur, lentils, and black beans are a few to consider. Cook once and use through the week. They can be served hot or cold, added to soups and salads. 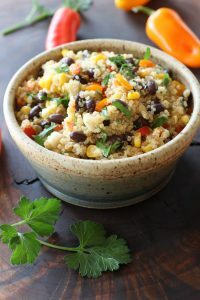 Black Bean Quinoa Salad is on of my faves. They also freeze well, so you have protein- and fiber-rich foods on hand. Meat is often the highest dollar ingredient in a recipe. Plan a meatless meal such as beans and rice, or replace half the meat in dishes such as chili, meatloaf or burger patties with beans, lentils or chopped vegetables. Eggs, one of the least expensive proteins, is another option. Hard-cook them for snacks and salads or scramble with vegetables. Plan to use highly perishable items — such as fish and seafood, salad greens, berries and fresh herbs — early in the week, and save more hearty items for later in the week. Enjoy leftovers for lunch or create new meals from leftover ingredients. 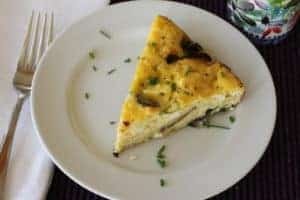 Cooked meat and vegetables can be revamped in a casserole, pizza, taco or a frittata such as this Mushroom Spinach Frittata. This cole slaw is a super easy and economical salad. The orange sweetens the deal because cabbage can run on the bitter side. Cabbage is sweeter the sooner you use it, but it’s heartiness makes it last much longer than most lettuce and salad greens, giving you more time to use it. 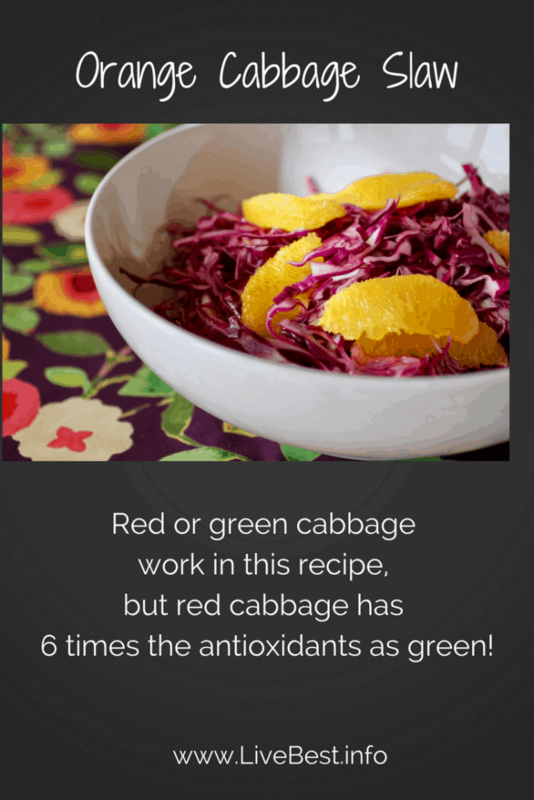 Red or green cabbage will work in this recipe, but red cabbage has six times the antioxidants as green. Slice in the food processor, on a mandolin or with your trusty chef’s knife. I like it cut into thin slices. Red or green cabbage will work in this recipe, but red cabbage has six times the antioxidants as green. Six!! 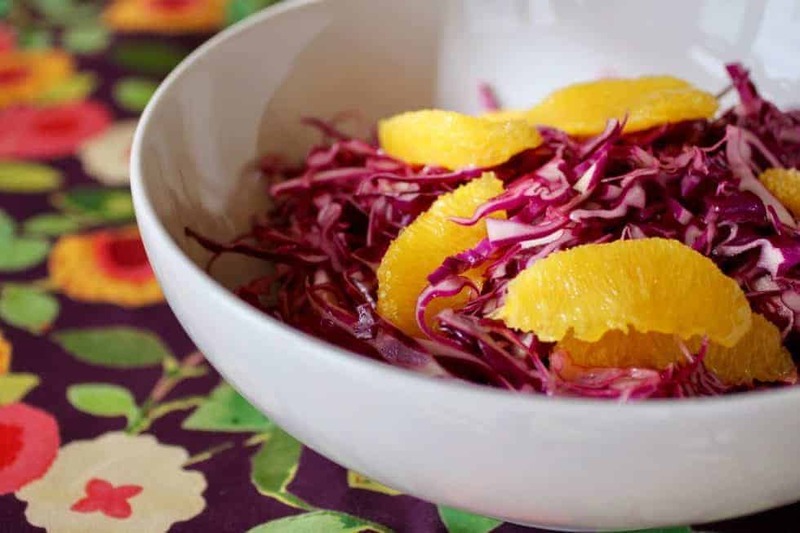 Mix: cabbage, sliced oranges, vinegar and soy sauce together. May be refrigerated 2 to 4 hours before serving.